This week’s member profile focuses on Rural Action’s favorite musician, Jerry Rockwell. 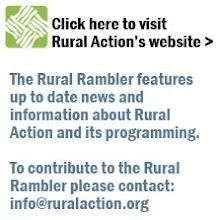 Jerry has been a member of Rural Action for many years and is also a member of our Multi-Year Giving Society. Jerry spends most of his time perfecting his sweet style of dulcimer music as well as instructing those who seek to learn the stringed instrument. You can find him at workshops and festivals all over the country, but Jerry wishes to spread the popularity of the dulcimer right here in our region. You can learn more about the dulcimer at his website. Jerry has provided musical entertainment at many of our Rural Action events and also offers one-on-one instruction if you are so inclined. We would like to thank Jerry for his continued support and wish him and his family a happy and safe holiday season.